A few dozen freshmen gathered in the Great Hall of the Neal-Marshall Black Culture Center,and faculty member Maria Hamilton Abegunde asked the students to repeat after her. “We are the change we want to see in the world,” Abegunde said, and they repeated, voices in unison. 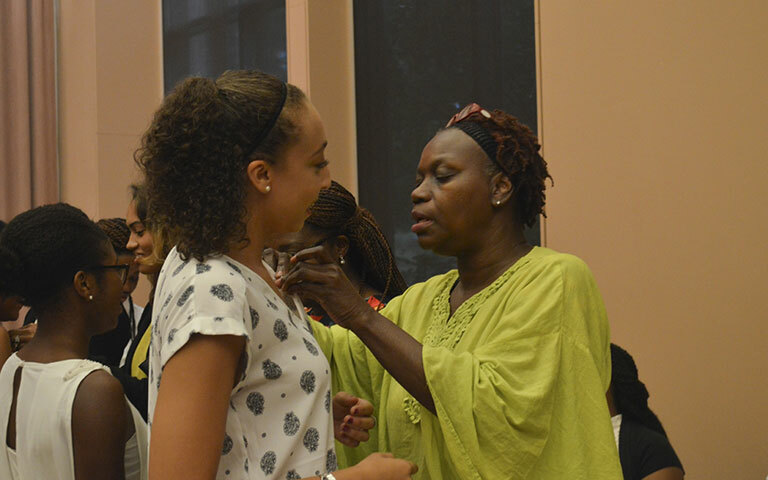 The Neal-Marshall Black Culture Center welcomed new students Thursday evening during the sixth annual Freshman Pinning Ceremony. Resources at the center include a library and places to study, along with the community, Swift said. “There are people who know you and have your best interests at heart,” Swift said. Freshman Sydney Tryon attended the event after receiving an email invitation. Tryon went to a very diverse high school, and she said the community at IU is similar. “I want to keep surrounding myself with that kind of environment,” Tryon said. Tryon said she is most looking forward to exploring all of the opportunities at IU, and that throughout all of that, the Neal-Marshall community will be there to back her up. Andrea Sterling, president of the Black Graduate Student Association, said the center makes sure students know they have a home and place to hold on to. Many of the students are the first generation in their family to go to college, Sterling said. The center also provides support in the face of adversity, Sterling said. Speakers at the event included James C. Wimbush, vice president of diversity, equity, and multicultural affairs; Monica Johnson, director of NMBCC; and Kealia Hollingsworth, president of the Black Student Union. Each speech welcomed students to the Neal-Marshall center and IU and reminded of them of their heritage. During the pinning, freshman went up in groups of four to receive their pin, which was given to them by older members of the center. “Coming here and getting my pin made me feel like I actually started my journey here,” Johnson said.